Reflecting on memories during the late thirties is like taking a walk through long colonnades. She has felt it a hundred times. The ranked memories, each alcove created for each event from the childhood, adolescence and the glorious youthful days. Some nights, when we are all alone, we see a full moon shining through the colonnades; whose solemn look befits all the sweet evocations. On radiant days, shadowy but warm colonnades remind of the unspoken apprehensions, and agonies we once survived. Just as the colonnades are magnificent, so are our memories. Still, somewhere exist fallen colonnades, the vexed memories. 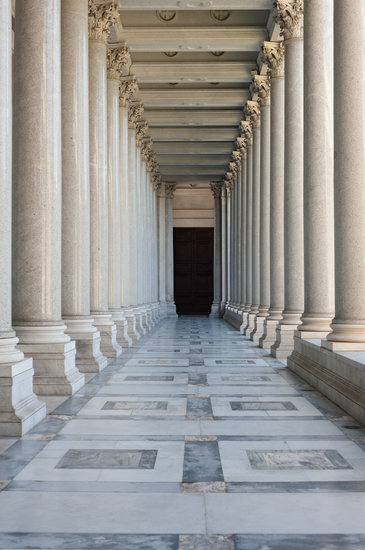 In 99 words (no more, no less) write a story that includes colonnades.